A few weeks ago I delivered a few thoughts on German universities at a meeting in Lübeck. I was invited, I suppose, because I’ve taught and studied at U.S. universities, and have now taught at a German university for several years, and therefore have a base of comparison. The friendly folks at Lübeck suspected I might have some opinions about how German universities are structured and run. They weren’t wrong. Instead of just letting these brilliant nuggets of enlightenment fade in the memory of the conference attendees, I’d put some flesh on my notes and share them with the world. For you busy executives who need my comments in summary form, here they are: German universities, in the late 1960s and early 1970s, set themselves the admirable goal of providing a free higher education to all students who qualified, regardless of the students’ race, gender, or economic or social class. That’s right, I said ‘free.’ The student need never pay any tuition, and receives a subsidy from the State to cover basic needs. To anyone concerned with social stratification, this appears to be – and really is – a noble endeavor. On the way from articulation of noble principles to actual real-world practice, though, a few things went wrong. The political and social necessity of opening up the universities (or at least the prospect of a university education) to ever-larger numbers of young people led to chronic overcrowding. Because there are essentially no private German universities, all these new students came streaming into the existing public institutions, which had to be expanded at breakneck pace. The student binge also led to a poorly-planned expansion of the existing universities’ administrative apparatus. Now, universities are run like bloated bureaucracies. Finally, the over-admission has resulted in a "go-it-alone" atmosphere for students. Because the university must spread its resources over such a large cohort of students (including at least 25% who will never graduate), it sometimes fails to single out and nurture the best students. To reduce overcrowding, institute a screening process to weed out prospective drop-outs before they waste years of their lives finding out they’re not really suited to university life. Introduce modest tuition fees – not the big loans American students face — but enough to help students focus their decision as to whether they really want to study at a uni, and to encourage them to put more effort into their work. Finally, slash the bureaucracy mercilessly, and re-orient it to serve the needs of students and professors. I’ll split the discussion into a few installments. First, what German unis do right. Second, possible reforms in two or three areas, starting with de-bureaucratization, if that’s a word. German universities are tuition free and, theoretically, open to all qualifying students. These principles embody ideas of solidarity and social justice which are very important to the German social state. Even though a recent court decisions lets universities will soon introduce tuition fees, they’ll be tiny in comparison to the fees charged in many other countries, and there will be provisions to reduce their impact on less well-off students. It’s no accident that in German, as in many Romance languages, the word for education is Bildung or Ausbildung, which have overtones of ‘construction’ or ‘formation’ to them. That implies a foundation of knowledge, then a substructure, then a superstructure. In many disciplines, this systematic approach is still respected. It leaves students (at least those who pay attention and who graduate) with a thorough understanding of the subject they’ve studied, and tends to discourage the sorts of silly offerings you see offered in U.S. universities. Although German universities seem to be just as beset by petty politics and faculty strife as large institutions everywhere, controversies about secular, ‘real-world’ political issues are less heated. Max Weber once wrote commented that in the academic world the only one who has "personality" is one who fully concentrates on his field. ["»Persönlichkeit« auf wissenschaftlichem Gebiet hat nur der, der rein der Sache dient."] Of course they have their own political beliefs – sometimes strong ones – but the ethic of collegiality is still strong, as is the principle that an expert’s opinions should be justified by careful reasoning and evidence. Thus, when professors do speak on popular issues, they do so in soothing monotone and stick to a carefully ‘objective’ style. The idea of compromising one’s dignity by appearing on a raucous television debate, for instance, would never cross the mind of a German professor. So far, so good. But, as you all of Germany’s many newspapers daily report, the German university system is in deep crisis. Of course, the papers say this about everything else in German society, but this time they have a point. The mainstream critique goes: our students spend far too much time studying (there’s theoretically no limit on how long they can study, and many don’t get their first degree until they’re 27 or 28); their university training doesn’t prepare them for the real world, many people go to university who really don’t have the aptitude for it. As in many other parts of German society, the vast network of petty rules and regulations buggers boggles the imagination. Nowhere is the analogy of bureaucracy to ivy as apt: its roots have chewed deep into the structure of the university, and irreparably damaged it. To receive compensation for the travel costs to a seminar, you have to fill out a form that not only required every piece of information related to my university post, but also application of a complex per-kilometer formula and answers to a bewildering variety of irrelevant questions, such as whether you brought a trained dog (Diensthund) with me. A professor who wants to hire an ex-student to do some simple computer work faces a lengthy inquisition, because this sort of temporary employment doesn’t fit into any of the existing categories. To get a new piece of office furniture, you have to make an appointment to visit the central furniture storage depot, trek halfway across campus, and sign several forms pledging your first-born son as security for the priceless 1982-vintage office desk you are taking in trust from the University. A new teaching assistant has to undergo a thorough medical evaluation, including a test of hormone functions. You almost always have only one person to whom you can speak to accomplish any bureaucratic task, you must appear before them in person, and they will rarely offer you more than token assistance in accomplishing it. If your bureaucratic intercessor is diligent and friendly – as many are – you are in luck. If they are lazy, incompetent, or rude, you are in hell. The fundamental problem is not that a bureacracy exists — any large organization will have to have some administrative bureacracy. The deeper problems are twofold: first, the bureacracy affects virtually every important decision that must be taken. One or two unnecessarily cumbersome procedures aren’t the end of the world, but dozens of them, when combined, begin to force everyone working at the Uni to devote lots of their time to tasks which have nothing to do with the actual mission of the university. The second problem is that there is very little buffer between important decisionmakers and the bureacracy. If a professor wants to buy new books, organize a conference, raise money for a research project, or hire a new staff member, he will have to deal personally with the resulting bureacratic nightmares, although perhaps he may get some help from his part-time secretary or a helpful colleague. It appears to be practically unknown at German universities for there to be entire departments, staffed by competent professionals, to do things such as organize fundraising and conferences, and handle personnel matters. Trimming this bureaucracy would mean fundamental, merciless reforms — decisive action of the kind that is very hard for Europeans even to imagine,such as eliminating many bureaucratic procedures fundamentally and permanently, denouncing people who aren’t doing their jobs properly, and firing people whose performance does not improve. In the coming weeks, I’ll post about student life, and about becoming and working as a professor, and then wrap it up with some modest proposals for reform. No, it’s not the Rolling Stones song, it’s everyday German reality. Wander around in any German city, and it won’t be long before you see a middle-aged woman with short, spiky, bright-pink hair. Blue and green are other popular options. When I was recently in Berlin, I saw a woman with orange, green, and brown hair closing up a day-care center. She also wore skin-tight leopard-skin leggings and eyed me suspiciously, which I suppose goes together. The moderator of a debate show on the public-affairs channel Phoenix, Gaby Dietzen, is a modest exemplar of this trend. Look at those cheeky white locks hovering above her wise, angular face like a tiny pair of wings. Ain’t they precious? [I rather fancy Ms. Dietzen]. The answer the foreigner seeks is why? What motivates a woman of a certain age to go into a beauty salon and tell Günÿ, "cut it all off and dye the remainder bright-pink"? This morning I got one answer. In the middle of a report about what old people do with their hair on Germany’s version of NPR, they interviewed a management consultant who had bright-pink hair. Like most electric-haired women, she was a baby boomer (68ers, as they are called in Germany), and their dyeing decision is a little poke in the eye of traditional dirndl-and-pigtails conceptions of female beauty. Further, she wanted to preserve just a little bit of the 68er spirit, even as she had made her peace with capitalism: "I just wanted to stand out from the crowd." Finally, she observed, in came in handy for a frequent traveler. Whenever she needed to meet a stranger in a public place, she just said "You can’t miss me — I’m the one with bright-pink hair!" The English and German-speaking worlds have welcomed the new Pope very differently. The German press focuses overwhelmingly on his thought, character, and background. The criticism — and there is plenty — deals primarily with his traditionalist views of church leadership and theology. Little attention is paid to his role in the priest-abuse scandals that have rocked the American church. There’s no article devoted just to this topic on the website of the Frankfurter Allgemeine Zeitung, a standard-setting right-of-center broadsheet. When the topic is mentioned it’s a matter of a few sentences, usually capped by the assertion that Pope Benedict XVI has recently made himself familiar with the number and scope of the allegations, and plans to take them seriously. The English-speaking press also writes about Ratzinger the man and theologian, but goes beyond his views. The British tabloids, for instance, have played up the silly Hitler Youth angle ("Panzer Pope"). Germans, spluttering with suppressed rage, point out that he was forced to join the Hitler Youth and never displayed the slightest enthusiasm for National Socialism. Ratzinger’s brief forced entry into the Hitler Youth is a silly distraction. What’s anything but a distraction, and what is getting an increasing amount of increasingly skeptical attention, is Ratzinger’s role in the priest-abuse scandal. Ratzinger has a long paper trail — most of which is sealed in Vatican lock-boxes — but he parts that have come to light aren’t pretty. (Andrew Sullivan has been blogging actively on this for a while.) For instance, Ratzinger sent a letter to American bishops which, among other things, asserted that investigations of abusive priests could and should be kept within the Church. Ratzinger wrote that the Church’s jurisdiction, which includes the ability to enforce a "pontifical secret," continues until 10 years after the alleged victim’s 18th birthday. This letter could obviously be read as encouraging members of the church hierarchy to avoid cooperation with the civil authorities until the victim is 28. In some states, waiting this long could bar prosecution. Why is Ratzinger’s role in the cover-up such a non-story in Germany? It’s not simply national pride, because German broadsheets are printing critical views of the new Pope. Obviously, one important factor is the much larger number of abuse cases that have been discovered in the United States. But, if you’ll let me play amateur sociologist for a second, I think there are other factors at play. In the U.S. and in England, the Catholic Church is just not the crucial social institution it is in many countries in Europe. Yes, European churches are empty, but that just means the Church is no longer much of a spiritual force. Because of this different social role, it might not appear too controversial to many Europeans that the Church should have a special set of rules and be able to keep matters like the priestly abuse scandal to itself. It’s a parallel society, with its own customs and its own legitimacy — and the State endorses its prominent role. In the U.S., though, we got lots of religions, and none of them is supposed to get any special treatment from the State. The Catholic Church is big and powerful, but it has to get in line with all the other churches. So when it works to keep ordinary crimes committed by its priests secret, and uses its power to hinder legal investigations by the authorities into these crimes, that looks very, very suspicious. If leaders of a large corporation would be thrown in jail for covering up serious crimes committed by corporate employees, why should some church — even the Catholic Church — be any different? Pope Benedict the XVI is soon going to realize that, despite recent pro forma statements of concern and alarm, he hasn’t gone anywhere near far enough to address the concerns raised by his conduct concerning the abuse scandal. * Perhaps because of this prominence, the Church is also attacked with an anti-clerical ferocity that would be unimaginable to most Americans. Take, for instance, a parody ad on the back of the satire magazine Titanic, which came out when Pope John Paul II was seriously ill. It featured then-Cardinal Ratzinger, with a knowing look on his face, above the German eBay logo "3…2…1…Mine!" You come home a little bit too late, a little bit too drunk, a little bit too happy. The wife eyes you distrustfully and asks what that flowery odor is. "Aww, we gave a bunsch of flowers to one of the (hic) sexretaries. Had a little party." Is that so. Well, why didn’t you answer when I called you at work? "Uhh, you called my office, and we were all in the resheption area drinking shampagne." Oh really. Well, I called the reception area too. 4 times. The phone rang and rang. "Ohh, thassright! We all went to a bar, thass right. Freddy’s place or something…"
At this point, you are living in what a German would call a Lügengebäude — a "Building of Lies." You pronounce it Loo*-gen-guh-BOY-duh. In English you can, of course, spin a tissue or web of lies. But I think the idea of crafting a nice, solid, bricks-and-mortar building of lies is more apt. It conveys how hard it is to get out of one once you’ve built it. I might also add that thinkers who create large, comprehensive philosophical systems — I need hardly mention which country has the leading reputation here — build Gedankengebäude, or "Buildings of Thought." I’d to extend this a little down the scale. Can I live in an Apartment of Lies(Lügenwohnung)? Drive around in a Car of Thought (Gedankenwagen)? 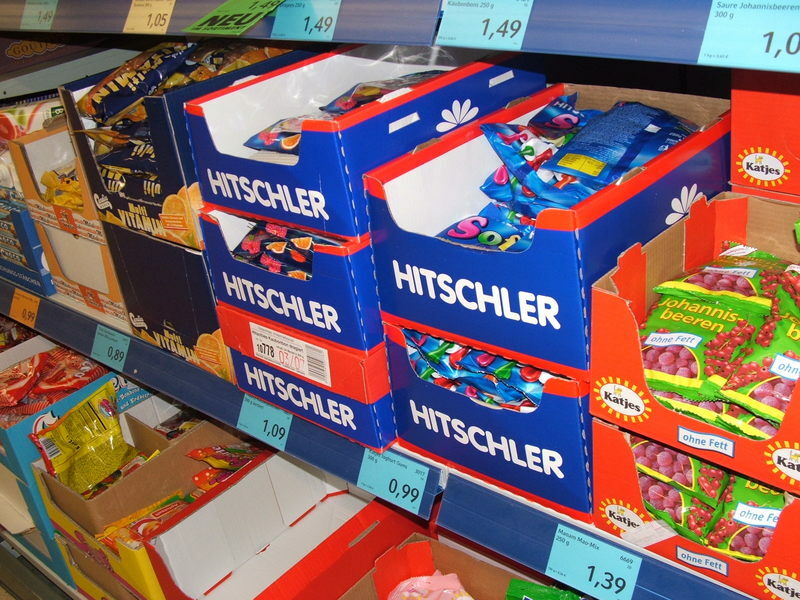 Hand someone a Box of Lies (Lügenschachtel)? The answer to all of these questions is: of course! German is, after all, the super-duper ultra-modular Lego language. * Actually, this pronunciation isn’t quite right, since the first ü, which has those two cute dots over it (umlauts), is pronounced a little funny. Germans claim there’s a difference between a regular u and ü. I thought only dogs could actually hear the difference until I began mixing up Schwül, which means humid, and Schwul, which means homosexual. I don’t know how many times I told people that Texas has extremely homosexual summers. That got their attention, I must say. No, this post has nothing to do with hot Asian babes, it has to do with the theory and practice of blogging. But keep reading, Asian babe-seekers! My humble blog is now up to about 200 visitors a day. You can see who "referred" people to this blog, and I’ve seen that about 20% of them come from Google to see a quick, nothing little post from weeks ago called "Naked Women & European Politics," which actually had to do with just that subject, but which won’t lead you to any naked women. So apparently creating posts with saucy titles brings you traffic from Google, so I’ll be including some sort of vaguely pornographic phrase in post titles from now on, to capture the all-important lonely pervert demographic. … the presumption that he’s trying to find the remains of Neitsche or Shakespeare. TristanCafe Pinoy Forums :: Hurray we have a conservative pope ! I ask you, including all of you who are reading this post only in the hope of seeing hot asian babes, can we think of a name for this phenomenon? Moron-trawling? Nincompoogling? Hmm, not really working for me. Write in suggestions — then I’ll trademark them and share the profits. And that’s a promise. Oh, and here are some hot asian babes. Sometimes, when Germany gets a bit too stuffy, it’s helpful to remember one thing. It’s close to France. I had seen the main sights before, so I mainly took long strolls and joined my comrades to visit some of the less-seen spots. Just around the corner from the hotel is the Museum of the Middle Ages (Musée national du Moyen Age), which is housed in a cool, roomy complex built on ancient Roman baths. The centerpiece of the collection is a series of six late 15th-century tapestries called the "Lady and the Unicorn." Five of these monumental works display a slim, graceful female figure relaxing in a symbolic wood with a unicorn and lion, in poses representing the five senses. In the sixth, the largest and final, the lady is displayed putting off an elaborate necklace in front of a tent which bears the motto A mon seul desir (To my only Desire). Nobody knows exactly what this phrase means. Here are images and descriptions, which have obviously been skillfully translated from French into English. Skillfully, but not perfectly. Because nobody has "localized" the translations (hired a native speaker to make the translation "perfect"), you will be treated to sentences like this: "Her little dog follows her every move, whilst at her feet a leering monkey, eating a berry or a candy, highlights the significance of the scene." The collection also features stained glass, devotional objects, free-standing (i.e. pillaged) cathedral sculptures and ornaments, and various vestments and fabrics. Especially interesting are the private possessions: portable candle sticks, coins, pilgrimage medallions and good-luck charms, prayer books, and private altars. There are also many combs — intricate, decorated pieces of woodwork, often with inscribed initials or inlaid mirrors — that have survived centuries. The religious art is largely by unknowns or "workshop of the master of." The elaborately-carved three-dimensional wooden altars have an earthy directness to them: open-mouthed, moon-faced Virgins, arms crossed across their chests, weep big silver tears at the base of the Cross. The crucified Jesus has sunken cheeks, jutting ribs, bloody wounds, and a grimace of brutal, wracking pain. The baby Jesus is often portrayed being circumcised, disputing with the elders in the Temple, being presented to Simeon and Anna. You can almost picture the toothless peasants filing by, explaining the scenes to their children, preparing them for a live of devout servitude. It’s wonderful stuff. Altogether more cool and elegant is the Musee Guimet, which houses a collection of Asian art originally started by an industrialist from Lyon, Emile Guimet. Four spare and well-laid-out floors contain fine pieces from China, Japan, Korea Cambodia, Nepal, and India. The Cambodian and Vietnamese collections seem to be the strongest, and the entry hall is dominated by monumental sculptures. One of the most extraordinary is an almost-whimsical Cambodian sculpture of a man with a horse’s head. Perhaps it’s Vishnu, but nobody’s really sure. The Musee Guimet has the distinction of being the best-illuminated museum I’ve ever seen. Tiny halogen spotlights, well-hidden in the ceilings and pillars, subtly highlighting the most graceful features. The gastronomical highlight of the visit was certainly Anacreon, a restaurant run by a former chef at the Tour d’Argent. We went in the company of two Paris-dwellers I met, David (an American) and Stephan. I had some creamy goat cheese with peppers and positively fluffy filet of cod in peppercorn sauce. Behind us, on a small table, sat a silver instrument which looked like a small coffee vat with a large handle attached to the top. I make no claims to being a gourmand, but I thought I recognized a duck press. David, who speaks good French, asked the waiter for details. The waiter, who we’ll call Frederic, looked to be in his mid-30s and wore wearing expensive black pants, a grey striped shirt (untucked, of course), an all-over tan, buzzcut, and bulbously stylish black plastic glasses. You could almost call his eyeglasses cynical. I wouldn’t be surprised if his pants were actually silk, but I didn’t touch them, even after several glasses of wine, so I can’t be sure. Frederic put on a slightly supercilious smile, and explained to the American chowder-heads that of course, that was a presse a canard. David asked what it was used for, and Frederic said something to the effect of "we put the heads of many little ducks into it, and press their brains out. We French love such things!" This explanation earned a bit of skepticism, so Frederic admitted that it was actually used to make ostrich-egg omelets. Finally the chef came out to put an end to the tourist-baiting. He explained that the duck press, which had legs in the shape of two elephant heads, was actually created especially for the 1900 Paris World’s Fair, and the elephant legs symbolized France’s colonial possessions. One uses the duck press, in fact, to make pressed duck. You take the body of the duck, combine it with brandy, and then gently squeeze out the juices, which are then poured over duck breast. You can order it at Anacreon, but you must do so two days in advance, and God only knows how much it might cost. Before I close, let me make clear that, as usual, the Parisians I met were cordial and patient, and even Frederic was just having a spot of good-natured fun with us. Stephan, the only Frenchman at the table, displayed no sign of irritation at the five Americans asking moronic questions. Really, it’s a mystery to me where Parisians have gotten their reputation for arrogance. 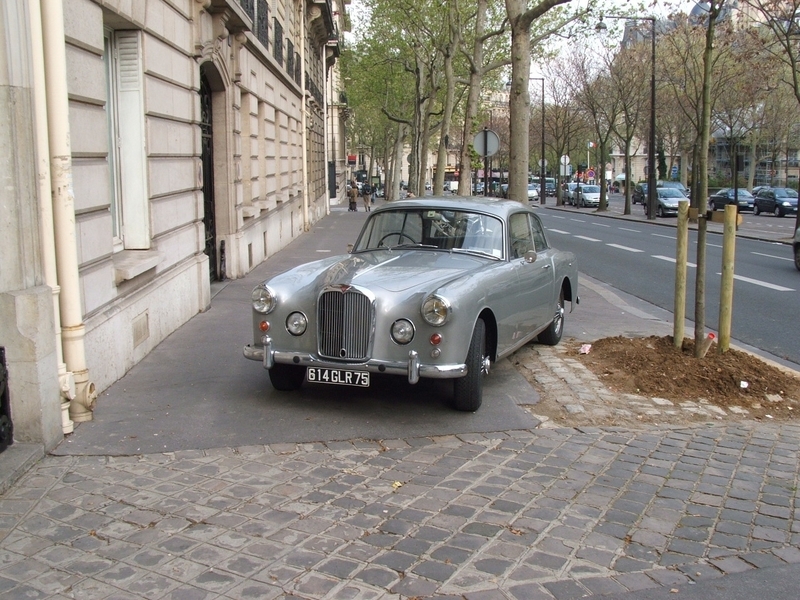 Well, I suppose parking your Bentley in the middle of the sidewalk on the Avenue du President Wilson doesn’t really help matters. But we all have those moments. Now that the sun shines until 9 PM, I often take a leisurely bike tour around town after leaving work. 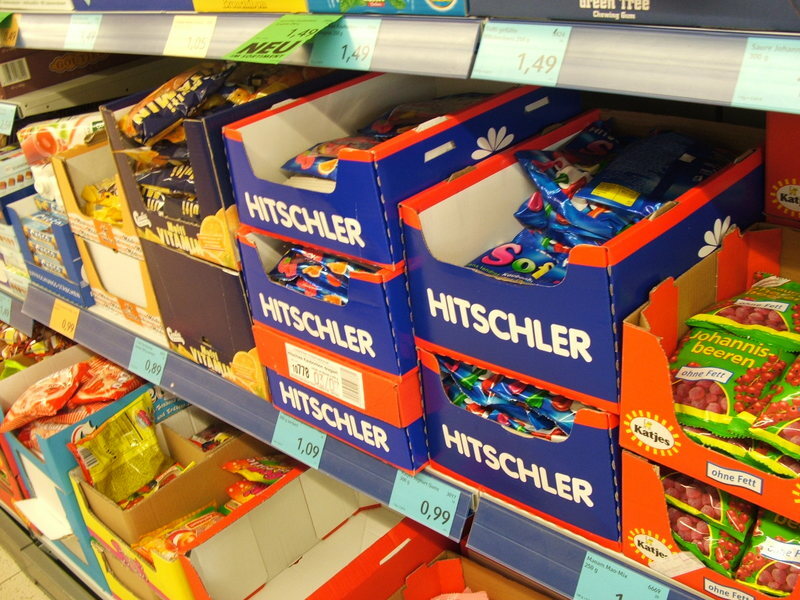 Yesterday I stopped by a store, where I saw these candies. No idea why, but I experienced a strong urge not to buy them. Especially on April 20. Can anyone explain this odd feeling? 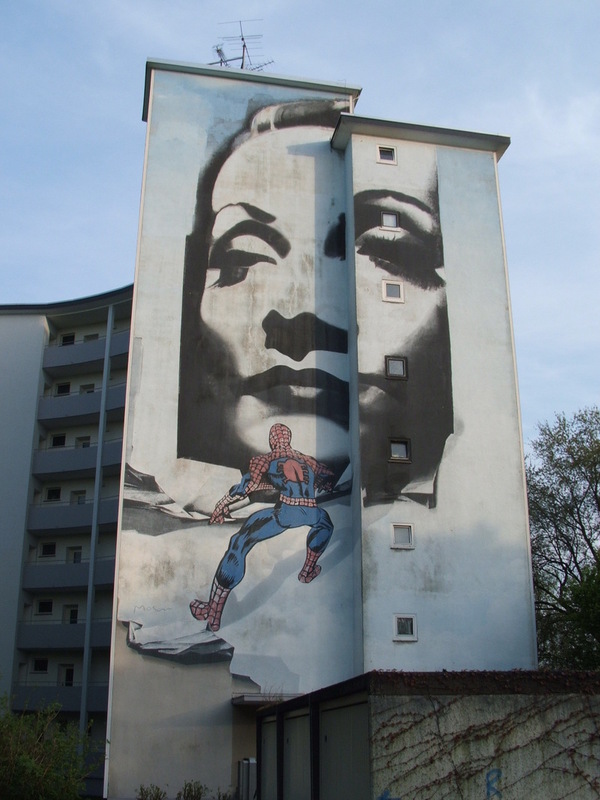 On a less unnerving note, I looked through some trees and noticed the following mural painted on the side of a large public-housing block on the Vennhauser Allee in Duesseldorf. "Whoa nellie, what’s this? Icy, Teutonic eroticism? My spidey sense is tingling. Wait, that’s not my spidey sense after all…"
Many Christians in the new Pope’s homeland reacted to the message from Rome with mixed feelings. Ecumenical outreach is close to the heart of many Catholics and Protestants in the homeland of Luther’s Reformation. Confessional boundaries are especially painfully felt here; the divide goes through many families. The wish for more cooperation and a shared communion finds great understanding among many German bishops. But Ratzinger has up to now remained unbending. His Vatican document "Dominus Jesus" from the year 2000 was a cold shower for ecumenicals: He denied that Protestant churches were even real churches. Ratzinger demonstratively avoided the first Ecumenical Day of Churches in Berlin in 2003, instead going on a confirmation trip to Upper Bavaria. Ratzinger is also controversial owing to his role in the pregnancy-counseling affair. In Germany, it is technically not legal to have an abortion, but an abortion during the first 12 weeks of pregnancy will not be punished if the woman fulfills certain requirements, including going through pregnancy counseling. Although most German bishops wanted the Catholic Church to offer such counseling, Pope John Paul II, with the active support of Cardinal Ratzinger, forced them to withdraw from the plan. In their view, the Church would be jointly responsible for an abortion if it participated in the counseling, but was unsuccessful in preventing the woman from deciding to abort. The "overwhelming majority" of German bishops, according to the FAZ, disagreed with this decision. Ratzinger’s strength is his "overwhelming theological intellect." His many scholarly publications are well-regarded, and the choice of Ratzinger honors the strong German tradition of scholarly theology. Yet here, Ratzinger’s role as enforcer has left him with many bitter enemies: he required theology professors to take loyalty oaths and prevented some from becoming theology professors by denying them the "nihil obstat." In case you’re one of the handful left on earth who hasn’t read Dan Brown’s Da Vinci Code, an important plot point happens in the Church of St. Sulpice in Paris, which I visited this weekend. In one corner of the church stands an obelisk with a globe and cross atop it. Before the obelisk extends a line in the church floor made of brass. According to my shaky memory of the book, Brown says something like this: the brass line was put there by a secret gnostic society calling itself the Priory of Sion, whose mission was to keep alive the secret knowledge that Christ had a child, in order to signifiy that a pagan temple had once existed where the church stood. The Priory then buried a key under the stones near the obelisk, which key would enable the finder to unleas…you get the picture; the old secret-society-church-stone-key-routine. The ‘meridian’ line materialized by a brass inlay in the pavement of this church is part of a scientific instrument built in the 18th century. This was done in full agreement with Church authorities by the astronomers in charge of the newly-established Paris Observatory. With a Gallic flourish, the church management warns: "No mystical notion can be derived from this instrument of astronomy except to acknowledge that God the Creator is the master of time." Well, let me make it official. Front Page Magazine published a fake editorial. Background: Front Page is a website run by an American named David Horowitz. Horowitz claims to be a former Trotskyite who has now turned into an American-style conservative. His favorite issue is the politics of American university professors: he claims they’re mostly left-wing (by American standards, true), and that individual left-wing professors harass and persecute conservative students. He’s proposed legislation, which may pass in several states, which he says would restore balance to America’s universities. I read an editorial on the website by an anonymous "European professor" who says he came to the United States and was shocked to see left-wing professors persecuting their conservative colleagues. Problem is, this European professor doesn’t exist, or at least he didn’t write the editorial himself. No European intelligent enough to have become a professor would use words the way he did; the opinions and the word choice are all fake and wrong. It’s as if an American described a soccer game and referred to goals as "touchdowns" and penalty kicks as "field goals." Fearless soul that I am, I publicly accused Frontpage of publishing a fake editorial, and gave them several chances to respond. They haven’t yet, and it’s been a good long time. So the editorial, I hereby conclude, is just plain fake. It’s hardly an earth-shattering development, but you’ve got to wonder what drives people to invent such ideological sock puppets. And it wouldn’t be the first; consider if you will the surrealistic case of controversial economist John Lott. After he published a series of controversial studies, an ex-student of his named Mary Rosh rushed to his defense online, praising his teachings skills and scholarly virtue. Turns out, unfortunately, that Mary Rosh was, uh, John Lott. I was in St. Peter’s (before the Pope’s death) and heard a choir singing an Ave Maria I’d never heard before. Something serene, gracious, with a measured but refulgent climax. The choir turned out to be the Vassar College Choir, and the piece was a setting of the Ave Maria by Franz Biebl, a 20th-century German choral composer whom I’d never heard of. There’s a short English bio of him here. Biebl, who served in the German Army during World War II, commends Americans for serving German POWs the same food American soldiers ate and praises American choirs as the best in the world. He was the choral programmer for Bavarian Radio until his retirement in 1965. If you’re into jangly, challenging contemporary works, Biebl’s not your man. But there’s no doubting the simple gorgeousness of his Ave Maria, which was originally composed in 1964 for a choir of Munich firemen. Choir directors, especially in American, love this crowd-pleaser (the site claims to have links to MP3s of the piece). Fortunately, a couple of good recordings of this piece are available. In 1994, Teldec records released a classical-crossover disc called "The Myth of Mary" which contains a shimmering rendition by the male vocal group Chanticleer, whose otherworldy refinement never fails to inspire. The Ave Maria shined through the rest of the dreck entries of questionable taste on the Myth of Mary CD, and became a minor staple of the American choral repertoire. You can now also find versions by the Seattle Pro Music Choir and the Robert Shaw Chamber Choir, among others that I own. The Seattle Pro Music’s version is my favorite, as it has a hint of surging enthusiasm that I think fits the piece well. I have searched and cannot find an all-Biebl CD. Surely he’s earned it? A song, or an advertising jingle, that invades your consciousness and won’t leave. There’s no word for this in English, so here the Germans have the clear linguistic advantage (you can also "pre-pone" an event in German and officially "dis-invite" someone). Here’s where German comes to the rescue, with Ohrwurm, literally "ear-worm." You can almost picture the cute little fellow camping out in your ear, singing the inane ditty over and over, cheerfully evading your increasingly desperate attempts to silence him. I want hereby to start an official campaign to bring Ohrwurm into English. Shouldn’t be too difficult. Just start telling your friends "Crap, that new Danii Minogue single is such an earworm." When they ask you what an earworm is, tell them, and urge them to start using it in their normal conversation. Note to entrepreneurs: trademark the word "Earworm" while it’s hot! While on the subject, German has a word for a song that is popular for matter of weeks and then drops into the memory hole. It’s an Eintagsfliege (One-day-fly), named for the sort of flies that live only a few hours (English: Mayflies; Latin — pricelessly — Ephemeroptera). One-day-fly doesn’t really work in English, so let’s just call these songs…Ephemeroptera. OK, perhaps not.